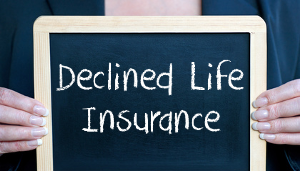 If you have been declined for life insurance all hope is not lost. Insurance underwriters don’t like uncertainty. If a client has medical issue the underwriting department would rather see a period of time between the occurrence and the treatment provided as well as successful follow-ups. Any ambiguity and they always assume the worst. No news is bad news. 1. Pick A Better Company – If you worked with a captive agent then the solution that was presented to you at application was within whatever company that agent represented. Clearly that wasn’t the best fit. 2. Shop Around – Companies change their underwriting standards. Some companies are more aggressive with certain health issues than others. Sometimes depending on their existing portfolio a company could more lenient on diabetes or heart issues for example. 3. Avoid a Second Decline – Companies can view your history through the MIB. One red flag like a decline that pops up is less than ideal but, a second would really sting. 4. Better Explanation of Your Situation – An underwriter just reviews the material that’s put in front of them. A conversation or a cover letter outlining your past declination may present your case in a better light and many times can change the mindset of the insurance company.